Thank you for all your support and prayers for Max and praise the Lord! for answered prayer. Max passed the sock this morning and the x-rays were clear! I could've wept in the vet's office. You've never seen a happier person than I, digging through the snow and poop to recover that sock. He's acting a little sheepish today, I think he's wondering what all the fuss was about. What a relief!! I opened my mailbox to find this magazine. I nearly dropped over. I'm certain I looked like a complete fool jumping for joy in the road. I LOVE CATH KIDSTON. I have no idea why I received this except that I placed an order with her online and must be on her mailing list now. Be warned that you should make sure you understand the pound conversion rate before ordering. I thought I had it figured out and didn't factor in the expensive shipping costs. I paid double the price of the item, but honestly, it was almost worth it. Her packaging is so stinkin' cute that you don't even have to open it to appreciate what's inside. I don't know why American stores stopped carrying her things. I've been able to find a few items on Amazon. Her designs just speak a language clear as a bell to me. It's probably best that I can't get my hands on this fabric without selling a kidney, otherwise my entire house would be covered in chintz. Tell me what designers knock your socks off? so glad Max is okay! the pictures are beautiful! Not only am I glad but so is Liz, that everything seemed to come out as expected. So happy to hear Max took care of his little problem on his own. I LOVE Cath Kidson. I feel I need to order something on line just to get that magazine. Is it a catalog or magazine. Is there any info in it about ordering one? I have two of her books. Yeah!! Just popping back to say, I found her website and ordered a magazine. It was free and free delivery. I can't wait to get it. Just seeing yours made me drool. 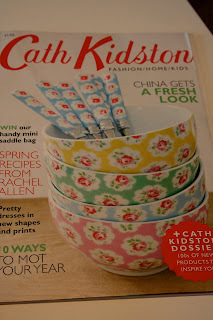 I just got the Cath Kidston catalog in the mail and I get it because I signed up for it on the website. I don't order from them because of the currency conversion even though I'm tempted to order a few things. Anyway, I love her fabrics too. Our little fabric store has some CK and she's also tearing CK sheets for yard goods. (smart!) I did find a nice company that sells fabrics that remind me a lot of CK. The name is Robyn Pandolph and I think some of her florals on blue backgrounds look a lot like CK, but honestly, nobody matches her. Too bad we can't get more of her stuff in the USA.